The list of plants I’d like to grow if I had space is endless and trees would make up many of that number. I am increasingly anxious to get on and start planting so that I might one day see them in maturity, but suspect I may already be a little late to achieve such a lofty ambition. A tree which offers quick rewards for impatient gardeners is Rhus typhina, the stag’s horn sumach. It’s actually half way between a large shrub and a tree, often wider than it is high. Stag’s horn sumach is prone to suckering, which on the upside means it can be grown very beautifully as a multi-stemmed tree, but on the downside makes it a complete nuisance in the wrong place. 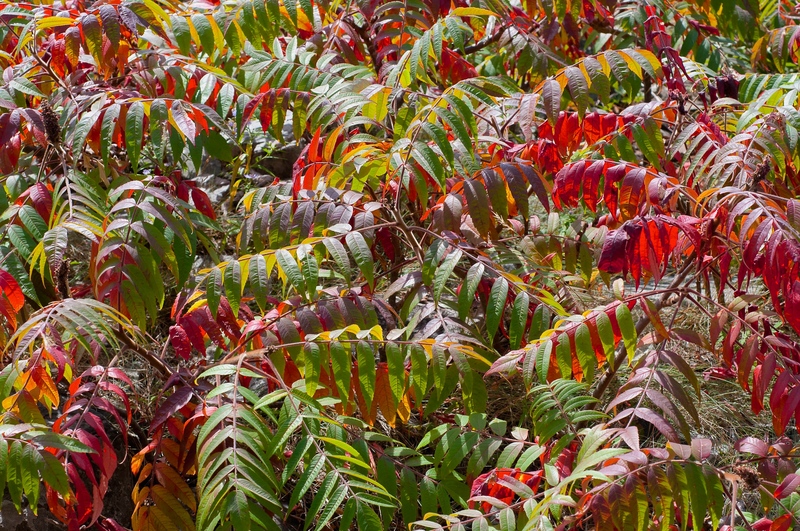 However for picturesque effect, blazing autumn colour and a touch of the exotic Rhus typhina is very hard to beat. Despite its North American origins it has a wonderfully oriental aesthetic and is easy to imagine pushing its way up between the boulders and waterfalls of a traditional Chinese brush painting. A variety with finely divided leaves, R. typhina ‘Dissecta’ AGM makes an equally lovely plant with a more feathery outline. Both trees are at their most ravishing in autumn when their umbrella-shaped canopies turn every shade of orange, red and purple before falling. Dark red, densely flocked flower spikes (looking rather like Devils’ horns) remain through winter, giving Rhus typhina one of its other common names, velvet sumach. Planted now Rhus typhina will have a chance to settle in before winter arrives, so go on, what are you waiting for? This was a very interesting post because sumach grows all along the roads and pastures here. I’m sure your variety is more beautiful but still interesting. They are magnificent at this time of year with their myriad of autumn colours. They have such a beautiful soft texture too.